In a large mixing bowl, beat butter with an electric mixer on medium to high speed for 30 seconds. Add granulated sugar and brown sugar. Beat on medium speed about 5 minutes or until mixture is light and fluffy, scraping sides of bowl occasionally. Beat in eggs and vanilla until combined. Beat in as much of the flour mixture as you can with the mixer on low speed. Stir in any remaining flour mixture with a wooden spoon until combined. Stir in chocolate pieces and (if you like) coconut. If you like, cover and store dough in the refrigerator for 24 hours. 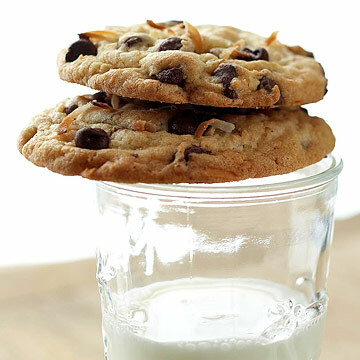 Drop dough by 2 tablespoon portions or by using a 1-ounce ice cream scoop 2 inches apart onto ungreased cookie sheets. Lightly press down on dough to flatten. Bake in a 350 degrees F oven 12 minutes or 14 minutes if dough is chilled or until edges are light brown. Cool on cookie sheets 1 minute. Transfer to wire racks and let cool.